Sesame supports columnar and freeform type reports only. The Crosstabber adds real crosstab reports to your databases. If you used crosstab reports in Q&A, output from The Crosstabber will give you comparable results. You can specify Totals, Counts, Averages or a combination of these to get the kind of cross-tabulation you're after. What exactly is a Crosstab report? 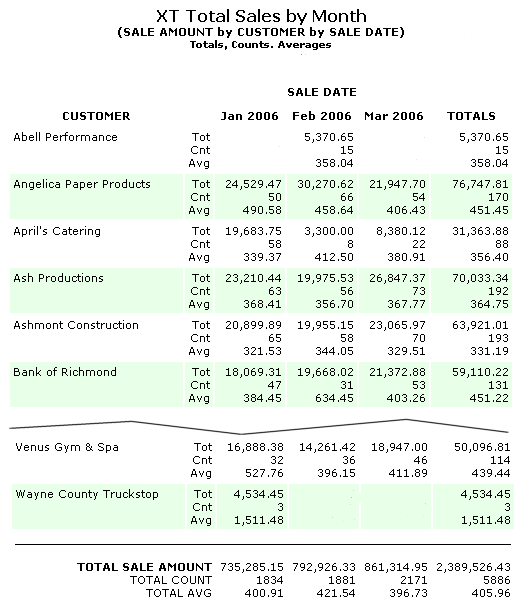 How many databases or forms can have Crosstab reports? As many as needed. Crosstab report designs can be added to any form in any database as long as you know which fields you want to use for the COLUMN, ROW and SUMMARY. When you create any report in Sesame, it becomes part of the database and application. Users who have access to the application and reports in general can run its Crosstabber reports just like any other reports. How much data can a Crosstabber report handle? Our Crosstabs support up to 600 columns, 600 rows and 100,000 records. These limits can, if needed, be adjusted when setting up the report. A lot of calculations are involved in crosstabulating data, so it's best to limit such reports to a few hundred rows and a few dozen columns where possible for the sake of time. Due to changes in Sesame 2.0 and later updates, we no longer sell the Crosstabber package. But we still custom design crosstab reports for Sesame databases of all types. Can you add a Crosstab report to my database? Sure — call us toll-free at 800-780-5474 (US/Canada) or  949-722-9127 outside the US and we'll describe how we'll go about it and give you a cost estimate. A crosstab report is a summary or totals-only report — an analytical report that shows relationships, trends or performance in a compact at-a-glance format that a regular columnar or freeform report simply cannot achieve. RIGHT: This report crosstabulates salaries by department and gender. At a glance, it shows the number of male and female employees in each department, along with the total salaries and average salary. 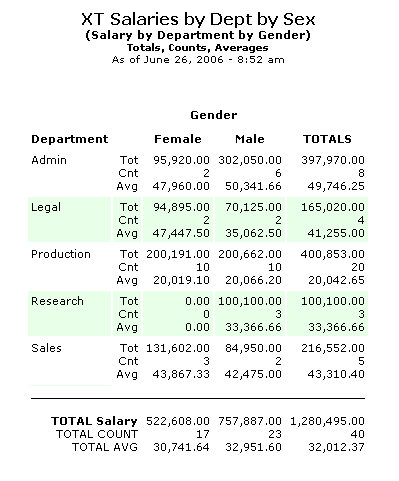 Here, Gender is the COLUMN field, Department is the ROW field, and Salary is the SUMMARY field. BELOW: The report shown below crosstabulates sales by customer and year/month. In this crosstab, Sale Date is the COLUMN field, Customer is the ROW field, and Sale Amount is the SUMMARY field. This crosstab features a custom column format that groups the sales by year/month. Both reports show the kind of output that The Crosstabber actually generates in Sesame.